A filter strip is an area of herbaceous vegetation that removes contaminants from overland flow. Riparian herbaceous covers are typically grasses, sedges, rushes, ferns, legumes, and forbs tolerant of intermittent flooding or saturated soils. They are established or managed as the dominant vegetation in the transitional zone between upland areas such as agricultural fields and aquatic habitats such as agricultural drainage ditches and streams. Riparian herbaceous cover practices have many names but are most commonly called vegetated or grass riparian buffers. Grassed riparian buffers are ubiquitous in Ohio. Filter strips are often located between agricultural fields and ditches and streams. Filter strips and riparian herbaceous cover are often considered synonyms. However, filter strips can be located anywhere on the landscape, while riparian herbaceous covers must be located adjacent to a surface waterbody. It can reduce the movement of sediment and agricultural chemicals directly discharged into surface water systems such as ditches and streams. 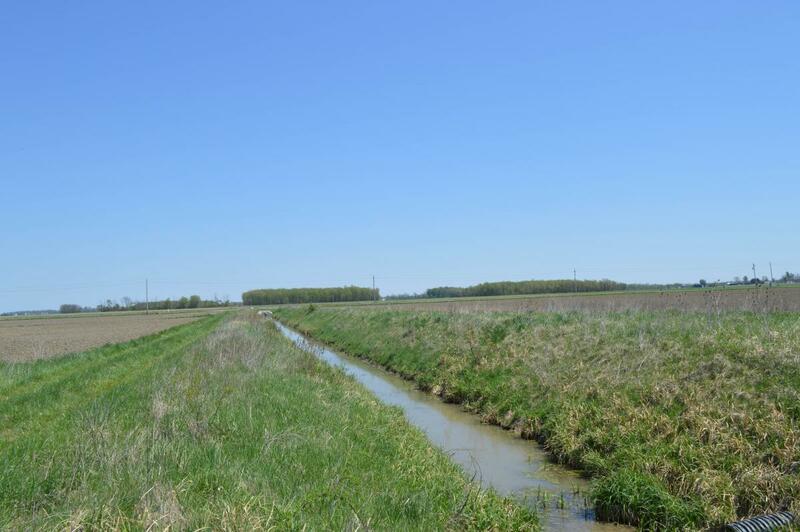 It improves ditch and streambank stability, and improves terrestrial and aquatic habitat. It provides a buffer between farming operations and ditches and streams. The water quality benefits of filter strips and grass riparian buffers are very variable and often site-specific. Sediment removal might exceed 50 percent depending on their width, soil characteristics, slope, and the size of the area draining to the filter or buffer. Pesticide and nutrient removal is likely to be less than 50 percent and is only a small percentage of the total load in runoff and drainage in areas where most of the discharge is subsurface drainage. For nontile drained lands, vegetated grass buffers can achieve up to 90 percent of nitrate removal (Osborne and Kovacic, 1993). For tiled lands, nitrate removal varies with seasonal hydrology. The removal rate was 75 percent during the low water table period but dropped to 14 percent during the high water table period (Liu et al., 2014). Once constructed, they are relatively self-sustaining. Periodic mowing or removal of woody vegetation might be required depending on the type of filter strip or buffer. Conversion of filters and buffers to saturated filters should be considered where high nutrient exports are a concern. It should be noted that the buffer’s vegetation might be affected by the presence of certain pesticides. For example, Post (sethoxydim) is acommonly used herbicide in the production of potatoes. Its main function is to control grasses. The presence of this herbicide in the runoff might cause the disappearance of grasses from the buffer strip, which can significantly reduce the buffer’s effectiveness. On an annual basis, forested vegetated buffers are more effective at reducing concentrations of nitrate-N than are grass vegetated buffer strips, but they are less efficient at retaining total and dissolved phosphorus. Costs are site-specific and will depend on the length/width of the buffer and the vegetation species used. Tyndall and Bowman (2016) estimated that the annual cost per acre for riparian grassed buffers is $233, on average. Riparian grass buffers qualify for the Conservation Reserve Program, which helps with the cost of establishment and provides an annual payment. associated with the sediment. When the flow velocity decreases, some of the runoff will move into the ground (infiltrate), carrying with it dissolved nutrients and pesticides. No day-to-day operation is needed for filter strips.